A pregnant police rank, who allegedly doused her spouse with a corrosive substance, was this morning charged and released on $300,000 bail for the offence. 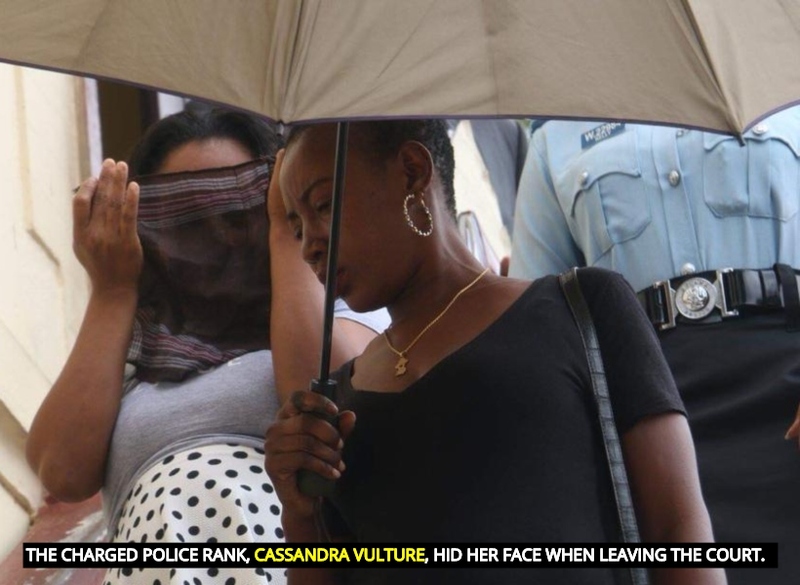 The woman, Cassandra Vulture, 30, of Albouystown, was arraigned before Chief Magistrate Ann McLennan who read the charge to her. Vulture denied the charge which read that on November 7,2018, at Camp and North Road Georgetown, she unlawfully and maliciously wounded Anthony Paul with intent to maim, disfigure or cause grievous bodily harm. The woman’s lawyer, Adrian Thompson, in a successful bail application, told the court that his client has been a member of Guyana Police Force for the past seven years and on the day in question acted in self defence since the alleged victim was abusing her. The lawyer went on to tell the court that his client made several reports to the station concerning the abuse but no action was taken. However, Court Prosecutor Simone Payne, stated that the victim and Vulture shared an intimate relationship for the past two years and have two children together. The Prosecutor added that the relationship subsequently ended since the victim caught Vulture cheating with her child father. The court heard that on the day in question, Vulture called the victim and asked him to take her to the hospital since she was not feeling well. It was said in court that Paul went and collected Vulture to take her to the hospital and she sat in the back seat of his car. However, while in the vicinity of Camp and North Road, Vulture took out a small glass bottle from her purse and throw the liquid on his left side face and body. Paul immediately began to feel a burning sensation about his body and he drove to the GPHC where he was seen by a doctor and admitted for his injuries. The matter was then reported and Vulture was arrested, told of the offence and admitted to the dousing Paul with acid, hence charged for the offence. Prosecutor Payne made serious objections to bail being granted to Vulture citing the serious nature of the offence and the fact that the victim is still hospitalized. The Magistrate however overruled the Prosecutor’s objection and released the woman on $300,000 bail. The mother of three was instructed to make her next court appearance on November 23.